High quality sensor for measuring temperature and humidity in saunas. 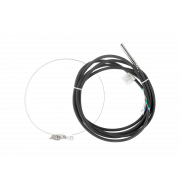 A precise temperature sensor for use with the Loxone 1-Wire Extension. The sensor is ideal for use in sensor pockets or as a strap-on pipe sensor, but can also be used directly in liquids.